The email Luis Chavarria‍ was forwarded by his coach at Episcopal High School inviting him to college game was different. “I always get things from area colleges like Texas, Texas Tech and other smaller local schools,” the 2021 Texas offensive lineman said. But this email was from Notre Dame, so he in turn, forwarded it to his parents who booked the flights up to South Bend. 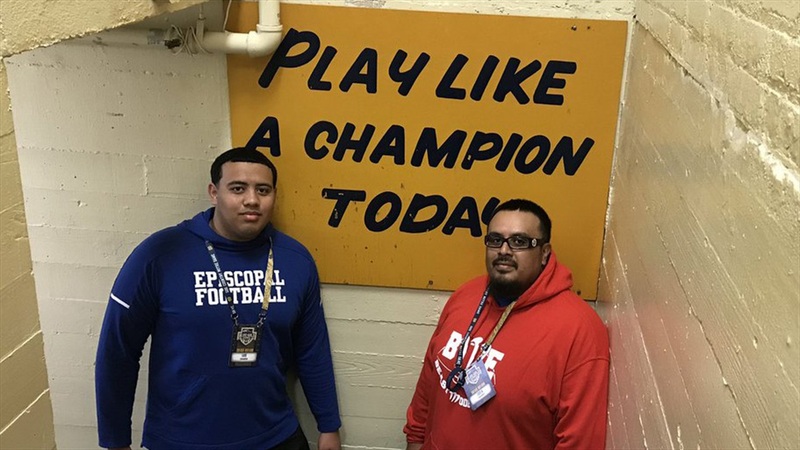 Initially, Chavarria was attracted to the Irish’s football program, but as he dug in deeper, he learned more about the educational opportunities at Notre Dame. “It was actually really, really good,” he added. “I liked the campus a lot. It was a really big campus and it was really beautiful. The weather, when I was there, was amazing. It wasn’t too hot. It wasn’t too cold. I really liked how big it was and how the buildings were just perfect to be honest. The big field with all of the sidewalks, that was actually a really beautiful sight. Chavarria is grateful to have early offers from Vanderbilt, Syracuse and SMU. Notre Dame offensive line coach Jeff Quinn introduced himself to Chavarria and said it was good to put a face to a name. He plans on keeping in touch with the Irish and hopes to be able to attend a camp this summer, when he could show them what they would get if they were to offer. “They’re basically going to get someone who is quick off the ball, strong, able to read a defense very well and is able to get to the second level very fast,” he said. In addition to his offers, he’s also receiving interest from schools like Texas, Texas Tech and Baylor among others.